There is discussion, sometimes contentious, about the origins of this dish. I favor Shanghai, but the beautiful city of Yangzhou is also a contender. Children love this dish and it's whimsy. For some, the four large meatballs represent the cardinal points of north, south, east and west. For others, they represent the blessings of felicity, prosperity, longevity and happiness. The meatballs are braised with a mild Asian cabbage in a delicious brown sauce. 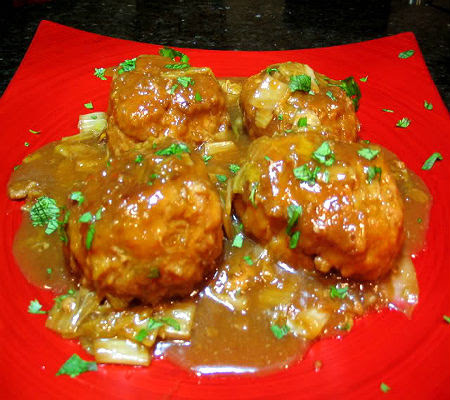 The finished meatballs, festooned with shreds of cabbage, do resemble a lion's head. When there are no children at the table, I opt for smaller meatballs. There are hundreds of recipes for Lion's Head; this version is based on one developed by Jacki Passmore. If you do not eat pork, or abstain from meat, you might like to try this recipe using a product called Gimmee Lean. In Shanghai these meatballs are served as an appetizer. They're also great for church suppers and other potlucks. 1) Combine scallions, water chestnuts, ginger and garlic in the bowl of a food processor. Pulse to form small pieces. Add pork, turkey, 1 tablespoon cornstarch and 4 tablespoons soy sauce. Pulse to combine. Form into meatballs of desired size. 2) Mix 2 tablespoons of soy sauce with reserved cornstarch to form a creamy paste. Add water if needed. 3) Heat oil in a heavy bottomed nonstick saute pan. Coat meatballs with soy paste. Reserve extra soy paste. Place meatballs in pan and cook over medium-high heat, turning once until lightly browned, about 2 minutes per side. Transfer to a plate. 4) Add cabbage and stir-fry just until wilted. Return meatballs to pan; add chicken stock, rice wine and 2 tablespoons soy sauce. Add water to bring liquid almost to top of meatballs. Bring to a boil over high heat. Reduce heat to medium, cover, and braise for 10 minutes. Turn meatballs, cover, and braise for another 10 to 15 minutes. Transfer meatballs to a serving plate. Top with cabbage shreds. Add 2 to 3 tablespoons of reserved soy paste to pan; bring to a boil over high heat and stir until sauce thickens, about 2 minutes. Spoon sauce over meatballs. Yield: 4 large or 8 to 12 small meatballs. Mary -- these look delicious and I love the whimsy of the name! I like the color of them. I too like the smaller meatballs something about the big ones turns me away. Mary, What a great sounding recipe...I always love when there are little stories to go with different foods. Ahhh, I LOVE meatballs. These look so good! Oh wow, Asian meatballs! These look so tasty!